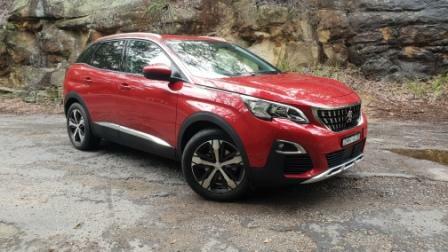 Car Review: 2019 Peugeot 3008 Allure. Peugeot’s 2018 3008, an award winning vehicle, is a second generation, extensively reworked version of the 3008 and facelifts released originally in 2008, with the second generation from 2016. 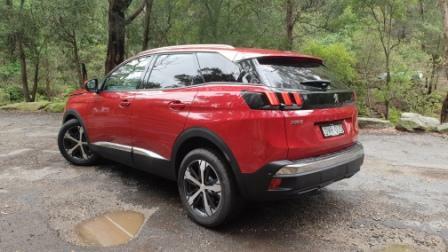 We test the 2019 spec Peugeot 3008 Allure, priced at just under $41K plus on road costs. Power is supplied by a torquey 1.6L petrol engine, with 1400 revs seeing 240Nm being available thanks to a low pressure turbo. With 6000 rpm on the tacho, peak power is 121kW. Transmission is a six speed DCT. Peugeot quotes combined fuel economy as 7.0 & 7.3L per 100 kilometres, with city cycle driving as 9.8L & 10.1L per 100 kilometres. The two figures are quoted due to the Grip Control being off or on. Grip Control is a choice of drive modes for differing surfaces, and activated via a dial in the forward centre console. The actual driving experience varies from slightly frustrating to a lot of fun. Frustrating because of the delay in engagement from park to reverse to Drive, to grin inducing pull from low revs as the 3008 Allure sets sail. 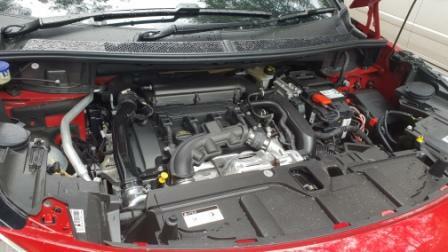 The changes are crisp, swift, smooth, in hte transmission when under way and manually changing does sharpen them further. The Allure is a stylish machine, with the underpinnings a new platform called EMP2 that allows a superb ride and handling package. Steering, for example, is razor sharp in its responsiveness off centre, with a quarter turn or so having the nose swing round quickly. At speed the variable ratio steering lightens up and there’s less effort required to work. 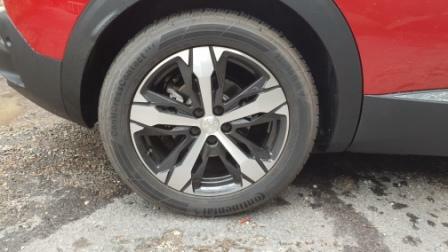 The ride on the 18 inch alloys, with 225/55 Continentals as the rubber, is beautifully tuned and balanced. There’s a suppleness that’s rare to find in anything other than mid to high end luxury cars, with an initial give that is followed by a progressive compression that stops before the bump-stops in all but the heaviest push over larger speed-bumps. Out on the freeway it’s absorbent to a fault, dialling out irregularities and undulations as easily as it rides over the unsettled gravel and broken surfaces. It’s beyond superb and in its class a genuine leader. The passengers feel minimal movement and what there is comes through smoothly and calmly. Weighing in at just under 1400kg before fuel and cargo, the relatively lightweight 3008 moves easily from lane to lane when required, and does so without noticeable body roll. 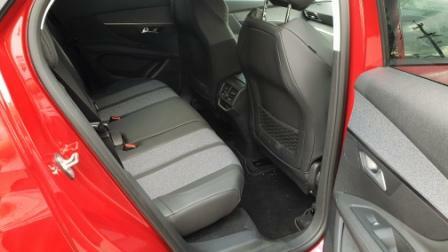 The Peugeot 3008 range is front wheel drive biased, and for the most part isn’t noticeable as such. It’s really only, and typical of front wheel drive cars, when the loud pedal is punched hard that something resembling torque steer is noticeable. Peugeot, being a French brand, isn’t adverse to a mix of style and quirks, with the latter good and not so. Certainly it’s stylish. The boxy design has enough lines, brightwork, and additions to the exterior to move it away from similarly styled machines. 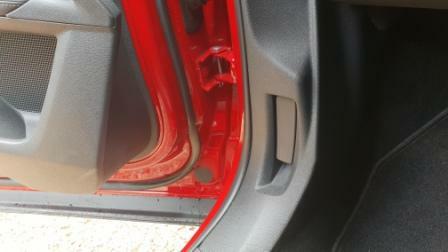 Although just the second level in the 3008 range, it comes with a powered tail gate and kick-activation. Inside it had a smartphone wireless charger. Gear selection is via a pilot style lever, with a button on the right to unlock and rock back and forth for Drive, Reverse, Neutral. 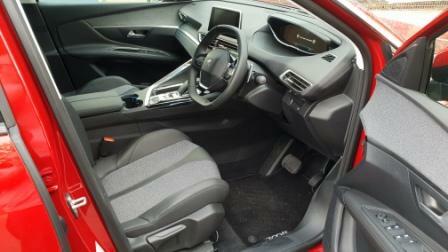 Park is a simple push on the top, and Sports mode enables manual changing via the selector or paddles. 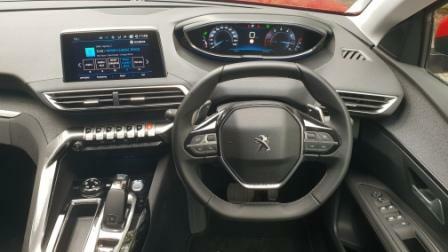 It also features the i-Cockpit, a full colour 12.3 inch LCD screen housed in a binnacle above the sightline of the top of the steering wheel. It’s clear and easy on the eye, will change colour at the turn of the drive mode switch, but either the top or bottom of the screen gets blanked by the tiller. 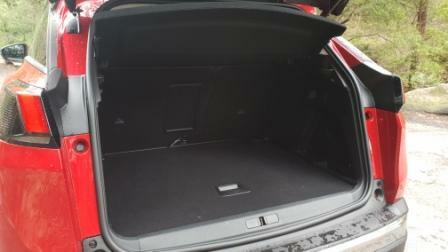 At odds with the charger pad and powered tail gate is no power for the cloth and leather seats. As comfortable pews as they are, to offer the two others but not electric seats is a strange decision. Another oddity is locating the bonnet opener in the left hand door’s forward meeting point, directly under the hinges. Bearing in mind a left hand drive market, hiding it away when the door is closed is one thing, elegance in design is another. Ergonomics are otherwise very good, with controls for the aircon and radio (including DAB) found via plastic vertically oriented switches that act as starting points for the very well equipped touchscreen. The cockpit itself is defineably a setup oriented towards a driver and passenger separation, with the centre console gently rising and curling towards the right hand seat under the centre air-vents and eight inch touchscreen. The materials themselves, a mix of soft plastics and an almost light denim style material, on the console and dash are pleasant to look at and feel. A lovely extra touch is the soft glow of ambient lighting in the cabin, the centre console cup holders, around the binnacle, and in the doors. Sound and apps wise, the DAB audio punches well, and screen mirroring along with Android Auto and Apple CarPlay is standard. The exterior is sweetly shaped, especially for a relative smallish 4447mm length. The nose is a very bluff and upright chrome affair that sits over a broad horizontal set of four intakes and a alloy look chin. Intense LED driving lights eyebrow the normal headlights, with a signature “fin” motif in the design of the cluster. Our test car came clad in the lustrous metallic red paint with black roof, called Metallic Copper and Neon Black, highlighted by chrome strips. Tail lights are the familiar Peugeot claw. The lower extremities are black polycarbonate and the rear bumper gets a chrome strip running full width. As stated, a stylish package. Finally, the Allure wraps up the good looks and lovely ride with a decent set of safety aids. Airbags all round, Autonomous Emergency Braking, Blind Spot Detection, Adaptive Cruise Control…not all of which are standard but can be optioned on the Allure. Peugeot look after the 3008 with a five year warranty, a 12 year corrosion warranty, and a 24/7 roadside assistance package. The Peugeot 3008 range is an award winner for the right reasons. It’s a superb handler, a very good drive, adds features at a good price, and brings the typical Gallic quirks. It’s roomy enough for four with no problems, has a good level of standard kit, is frugal enough in the real world and….well, it just does what it does at a high level all round. Check the 2019 Peugeot 3008 Allure out here.